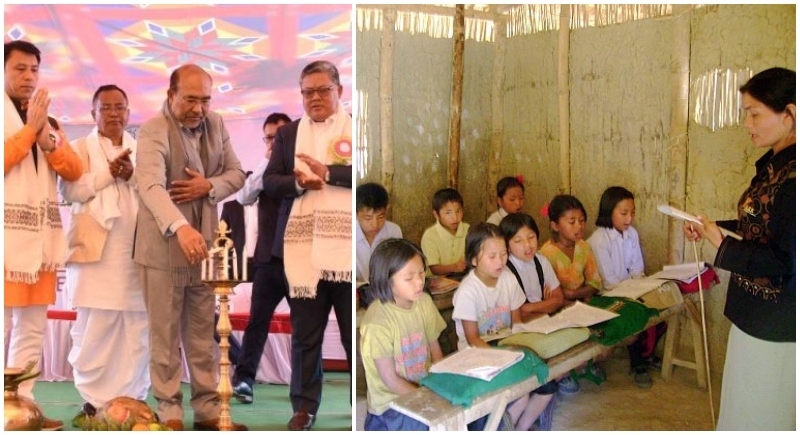 Imphal, January 19: Connecting people to the state developments, Manipur focuses on the mission to work towards development and escalate developments for children. In its new mission ‘School FagatHansi’, the state aims to give renewed thrust towards improvement of government schools. Launching the mission, ‘School FagatHansi’, Chief Minister N Biren introduced the new initiative with the objective of levelling up and improving the facilities for children in the state particularly the government schools. The mission is launches under an initiative under the Government’s, ‘Go to Village’ mission in Imphal. Under the mission, one government school each in all the 60 assembly constituencies of the State will be developed as model schools in the first phase. Speaking at the occasion as the chief guest, CM Biren Singh said that the missions have been successful in connecting people with the Government. Now, the Government intends to put special focus on improvement of Government schools because economic condition of the common people is not improving despite efforts as they generally spend huge amount of money in children’s education. Stating that all the model schools would have classes from pre-nursery to Class-X, the Chief Minister informed that no teacher would be transferred from these model schools for at least three years in order to maintain stability. Observing that involvement of local people, educationists, local club members and “meira paibee” (women leaders) in the scheme is of immense necessity, CM Singh urged all to extend cooperation. On the other hand, the Chief Minister said that Rs. 50 lakhs had been sanctioned by the State Planning Department for awarding cash prizes to meritorious students. Regarding the aftermath of passing Citizens Amendment Bill, the Chief Minister observed that protection of indigenous people can be started at individual level by not selling lands to outsiders. One should never sell precious ancestral lands to get a simple Government job or own a car.